They just opened a new restaurant near my job and everyone keeps raving about it and from the crowd you could tell it has to be good because we have A lOT of restaurants in this area and everyone has seemed to flock to this place. This is Pita Pan's second location, the original is in Astoria Queens which is known for it's Greek food and you know how much I love me some Greek, OPA! 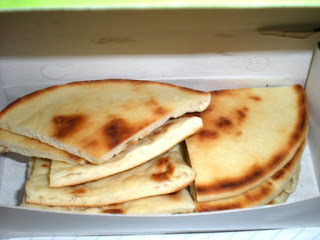 Pita Pan's tag line is "Fresh Fast Tasty", I am a fan of all three things so I decided to give them a shot. Today was Protein Day so I could not try what I really wanted which was a Pita Pan Gyro so I reluctantly decided to get a salad; they have a great selection of Gourmet Organic salads. I chose the Mandarin Salad; baby mustard greens with sliced almonds, mandarins, raisins, and honey vinaigrette. 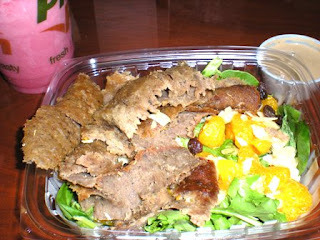 They give you the option to add protein for an additional charge, so you know I had to get Gyro Meat lol. For me, the best way to tell if a salad is good is by choosing to leave the dressing off AND I DID! This salad was full of so much flavor that I didn't even see the point of the dressing. Another thing I liked was that it was not HUGE; sometimes a salad can be overwhelming but if you are starving, they do give you the option to double it for an extra charge. 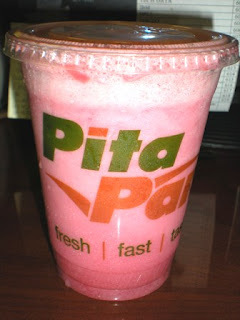 Besides a great selection of salads, sandwiches, paninis etc; they also have a variety of smoothies. I decided to try the Berry Smooth Smoothie which is anti-oxident berries, banana, mint, and fresh low fat yogurt. This was perfect for my afternoon slump; it woke my bum up lol. It was not heavy but instead very refreshing on this 90 degree day. I already told my sister that she has to meet me one day so that we could have dinner at the restaurant. Remind me again what you do for protein day...do you just do one per week? Sounds great--I'll check it out next time I'm there! I try to stay away from "Bad" carbs on the two days before my weigh in. This is something that my nutritionist would make me do when I was trying to lose weight and it seemed to work. She said it was to "shock" my system. I am so missing my oatmeal!